When you spend as much time talking to guitarists as I do, you hear it all–myths, misconceptions, misinformation, and outright legend. This is especially true when it comes to guitar care and maintenance. However, there are some that I hear over and over, and that’s what prompted me to write this blog post. Removing all your strings at once will not damage the neck. You can take them off and leave them off for a few days without worry. Now, if you need to leave the strings off (or completely slack) for weeks or months, such as for long-term storage or a serious repair of some sort, then simply loosen the truss rod bolt to remove any backward tension and your neck will be just fine. I’ve seen YouTube videos of men claiming to weigh over 200 lbs (and I believe them) standing on guitar necks. I don’t recommend you do this, but trust me when I tell you that your guitar’s neck is far stronger and more durable than you give it credit for. 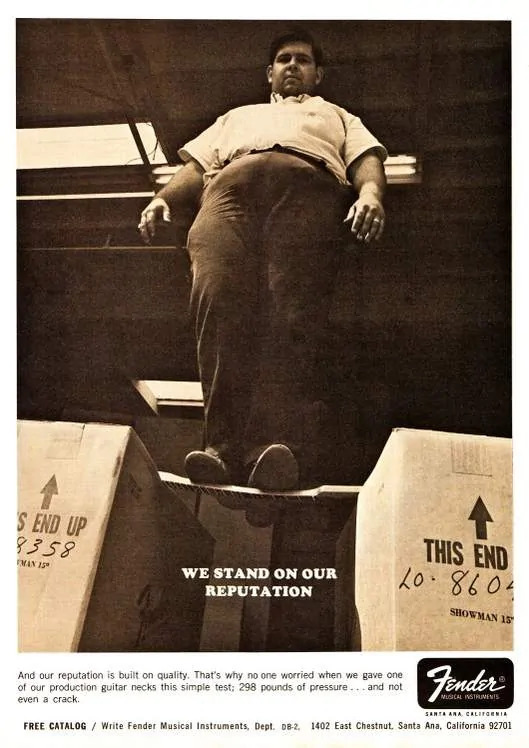 In fact, I was able to dig up this old Fender Guitars ad showing just such a stunt. Whether or not this is a myth depends on what you mean by “lemon oil.” It’s perfectly safe (and good for your fretboard) to use a tiny dab of one of the “guitar lemon oils” being sold by reputable guitar companies such as Dunlop, Peavey, D’Addario, and Kyser. These companies have no desire to damage customer’s guitars, which would be very bad for business. These lemon oil products have very little actual lemon oil in them. They are primarily other oils–such as mineral oil–with just a small percentage of lemon oil added. Though I can’t confirm this, I’ve been told that some may not have any actual lemon oil in them at all–just lemon scent and yellow dye. If you want to use lemon oil, stick to stuff made for guitars. This Dunlop 65 Lemon Oil is good suff. 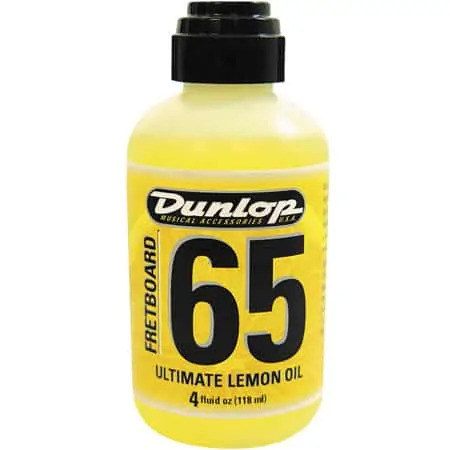 100% pure lemon oil at full-strength (or even partial strength) should not be used on your fretboard. It’s highly acidic stuff that’s so strong it can be used to remove adhesives and sanitize hard surfaces. It might look and smell great when you first apply it, but it’ll eventually dry out the wood (the opposite of what you want). Lastly, play it safe and avoid lemon oil products that aren’t made specifically for guitars–such as those for furniture, hardwood floors, etc. They may be fine, but why risk it on your expensive guitar? Stick to lemon oil products produced by companies that know and love guitars. WD-40 is a good rust remover for metal parts, and guitar techs will sometimes use it (carefully) for this purpose… but they remove the rusty parts from the guitar first. This is the important distinction: WD-40 can be used to clean rusty metal guitar parts, but the parts should be removed from the guitar first. Never spray WD-40 onto anything that’s still attached to the guitar. Don’t get WD-40 on any bare wood nor on the glossy finish of your guitar. Don’t use WD-40 to “lubricate” anything on your guitar and don’t use it to clean your guitar strings–because no matter how thoroughly you think you removed the excess, there will always be a little left on the strings, which you can inadvertently transfer onto your fretboard. Wow! Really, with just a little education you can safely and easily adjust your truss rod yourself. In fact, you need to know how to do this if you want to do your own setups, or simply keep your guitar buzz free throughout the year. Wooden parts naturally expand and contract with changes in humidity. This causes your neck to bend slightly forward or backward. It’s totally natural, but can result in action that becomes too high or too low. The remedy is a slight tightening or loosening of the truss rod bolt–literally no more than 1/8th of a turn (or less) in either direction. Some guitars will play perfectly throughout the year without needing adjustment, but this is very rare. As I pointed out in #2 above, your guitar’s neck is a lot tougher than you think. Yes, you should first learn the proper way to adjust the bolt, and learn what a “tight” and “loose” truss rod bolt feels like, but there’s some safe margin for error. Wait a second! Didn’t I just say that you should adjust your truss rod if you’re action becomes too high or low? 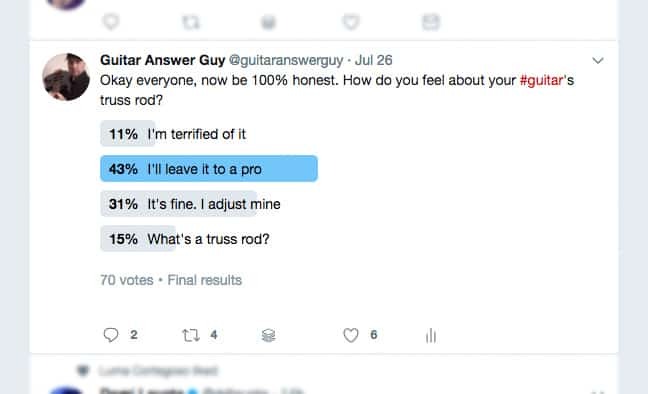 Yep, but what you need to understand is that a truss rod’s primary purpose is not to adjust action–that’s a secondary effect of adjusting the rod. The primary purpose of a truss rod is to adjust the amount of forward-bow or backward-bow in the guitar neck, and it just so happens that this will have a small effect on string height. To properly adjust string height during a setup, we raise or lower the guitar’s bridge, bridge saddles (if applicable), and nut. So, think about it this way: if your guitar had comfortable action and was buzz free, but the strings seemed to mysteriously become a bit too high and uncomfortable, or too low and began buzzing, then a slight truss rod adjustment is the proper thing to do. On the other hand, if everything’s been fine but you just want to raise or lower your action, then adjust that at the bridge, bridge saddles, and nut. Just know that when you do this, especially if you lower the strings dramatically, you may also need to adjust the truss rod slightly to compensate. This is where knowledge of how to properly set up a guitar will be needed, otherwise you can drive yourself a little crazy jumping from one thing to the next. A damaged, faulty, or improperly grounded guitar amp can indeed send electricity into a guitar, but this extremely rare and unfortunate scenario could happen regardless of what order things are plugged in. Getting shocked while playing guitar is a whole other topic–which I won’t go into here–that has nothing to do with the fact that you plugged in a guitar cable that’s already connected to a live amp. Instead, the most annoying thing that’ll happen when you do this is the usual loud POP you get any time you plug the guitar-end of a live cable into your guitar. Unless, of course, you use a guitar cable with a silent plug tip. Your guitar’s jack is called an “output jack” for a reason: it outputs a very weak signal through the guitar cable and into the amp. The signal does not flow the other direction–the amp is not feeding anything into your guitar. 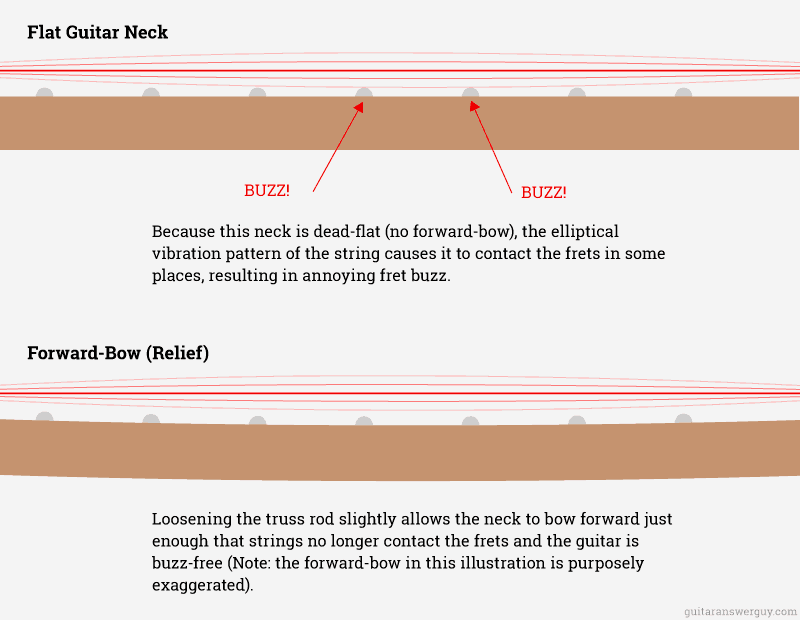 Don’t confuse this natural forward bow with “a warped neck.” Relief, forward bow, back bow, etc. are normal conditions for a neck, whereas “warp” is a term used to describe a piece of wood that has twisted in a bad way that could potentially render it useless. When I hear someone say they oil their fretboard every time they change strings, I cringe a little. That’s way too much oil… unless they only change their strings once a year. Putting oil on a guitar’s fretboard is rarely necessary, unless you’ve done some intensive, deep cleaning that dried out the wood (for example using steel wool, naphtha, etc. to clean an extremely dirty fretboard). Live in a really dry climate, you say? In that case, your fretboard needs humidity, not oil. 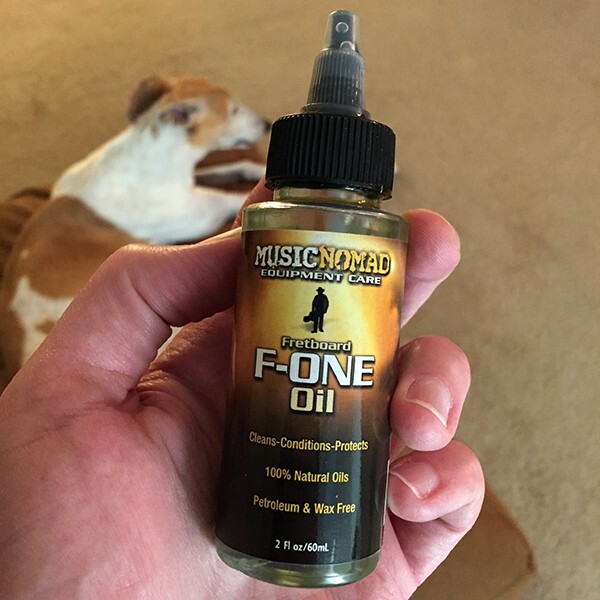 If you’re going to oil your fretboard, that’s fine, just be sure to use the right kind of oil and only do it about once a year. As I said, you may need to oil more than that if you’re routinely gunking up your fretboard (which happens if you regularly play live) to the point that it has to be literally stripped clean several times each year. 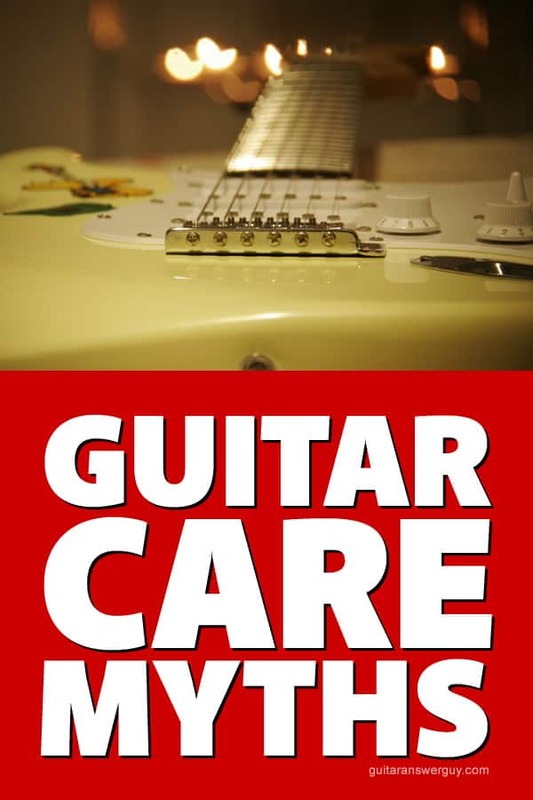 Want to Learn the Right Way to Care for Your Guitar? For years after I bought my first guitar, I struggled with all this stuff, and on several occasions did accidental damage to my guitar. There was so much misinformation flying around out there that I finally decided to cut through all the crap and just learn the right way. I bought and consumed every book and video series that guitar repair guru Dan Erlewine and the Stewart-MacDonald company produced. Learn basic electric guitar setups & general maintenance. An easy read with practical, step-by-step instructions and tips. Includes DVD. Does not cover acoustic guitar setups. Want to dive deeper into guitar setups, care, and repair? This books is more in-depth and it also covers acoustic guitar setups. Includes DVD. What guitar-care myths or legends YOU heard? Lay ’em on me and I’ll investigate to see if we can either confirm or dispel them.